You may have heard of my sister-in-law before. Her name is Tiffani Thiessen and she has been on TV shows with a cult following for most of her life. Most people call her Kelly Kapowski and have incredibly fond memories of her from their childhood. She graciously says ‘yes’ when people want to take a photo with her or get her autograph. She is a celebrity. However, to me, she is my very down-to-earth and wonderfully supportive family member. She is my friend. She is the most fun aunt to my children. She is the perfect wife for my brother. She is truly the sister I never had and someone with whom I chat with about all things, big and little. I feel grateful every day that she is in my family. One afternoon we were chatting about what we’d both been working on professionally and decided that a little celebration was in order. 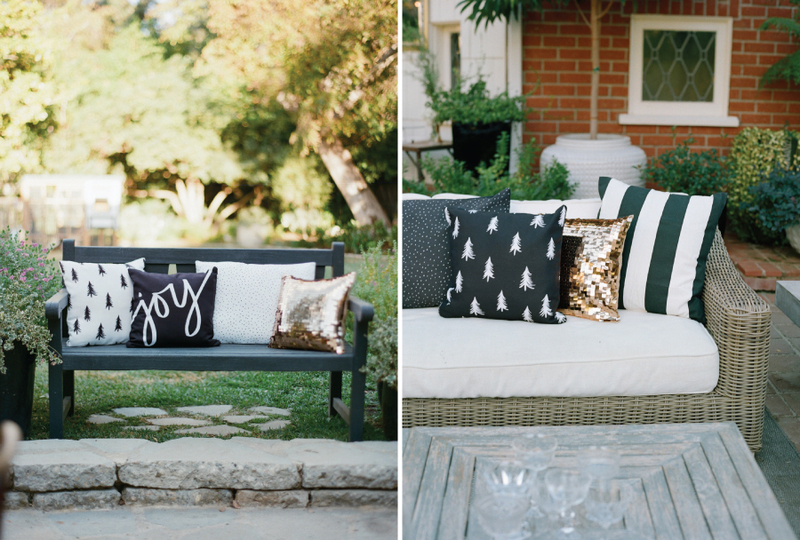 So we co-hosted a party to celebrate the upcoming launch of her new TV show, Dinner at Tiffani’s, and the launch of my holiday card collection and home décor. We thought that food and décor would be a great excuse to get a small group of our friends and co-workers together for a good time. 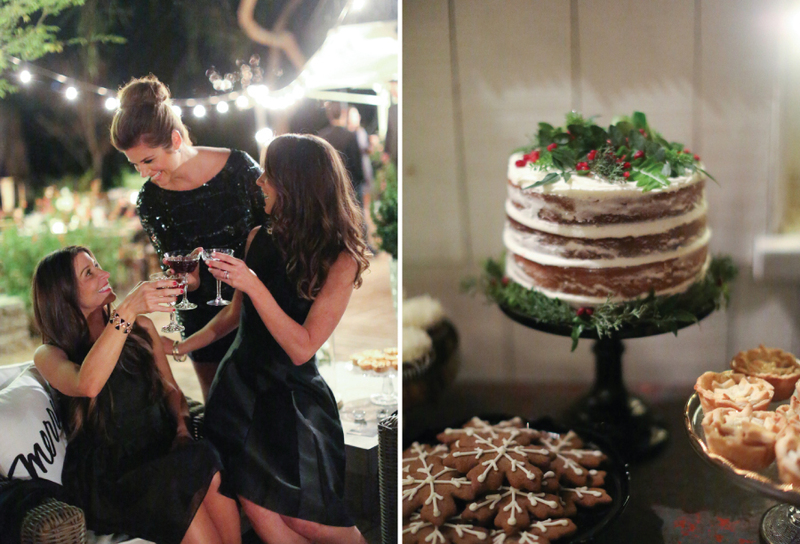 The party was held one evening in Los Angeles around the holidays, and it brought together some of our favorite designers and artisans. 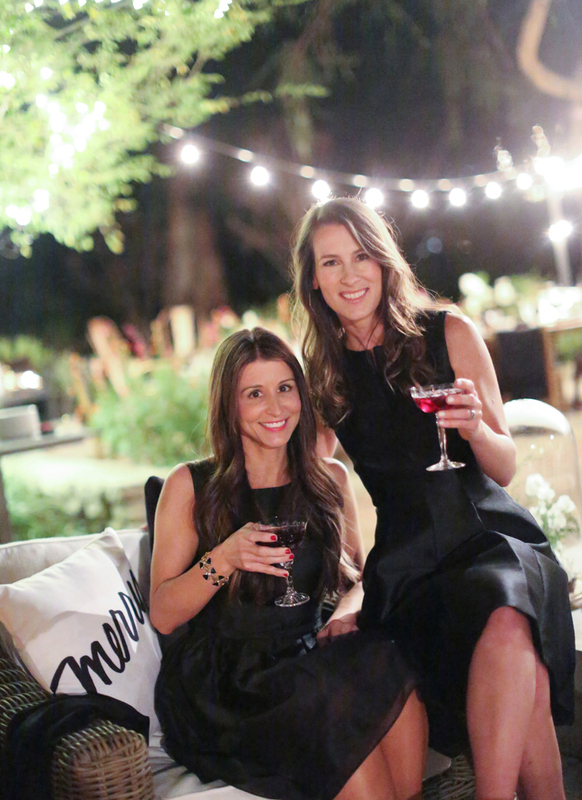 It was such a treat for Tiffani and I to work together to design and plan the event. 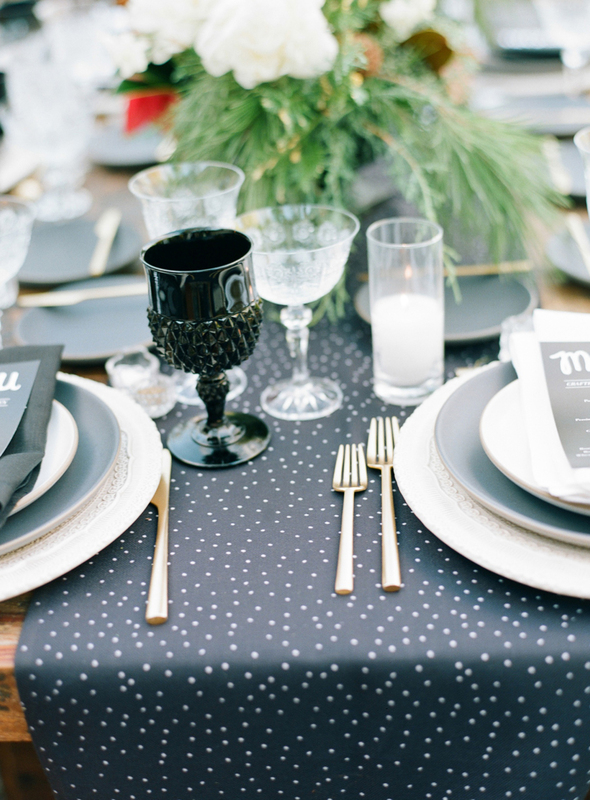 We created a black, white and metallic gold setting with a mixture of modern and vintage accents. We both wanted it to be elegant, yet cozy and certainly not stuffy, so we tailored our plans around this thought. 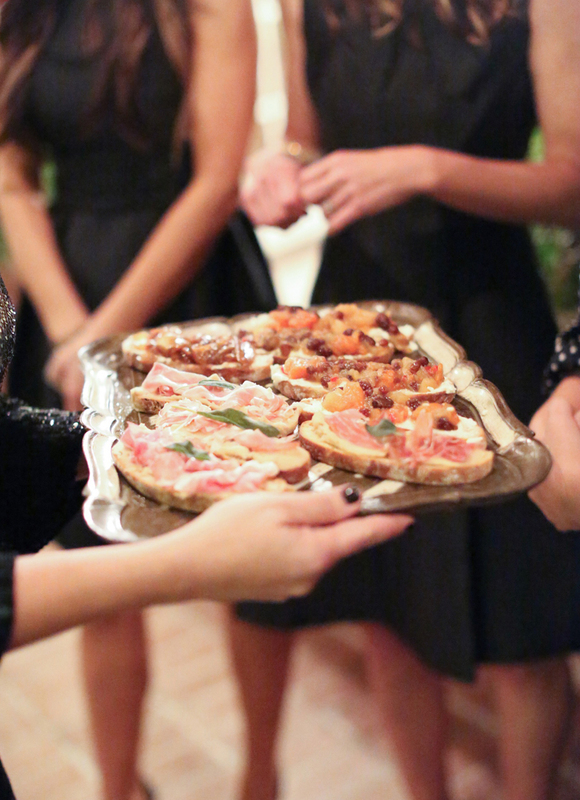 Small hors d’oeuvres were passed as the party started, but we kept it simple with open seating. Strands of white lights hung everywhere. 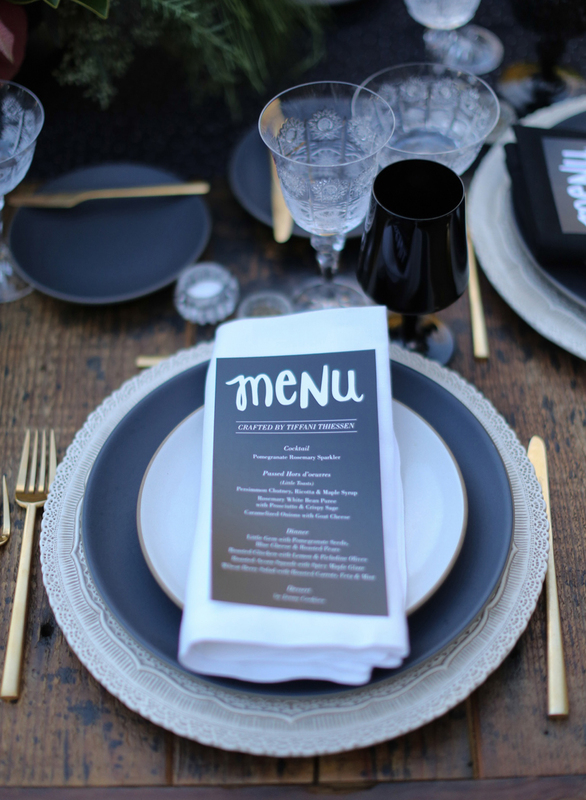 We chose table settings from Casa de Perrin with gold flatware and a variety of opaque ceramics and vintage goblets to top the table runners I designed. Moon Canyon designed the most beautiful greenery arrangements that spilled out every so perfectly from every surface. 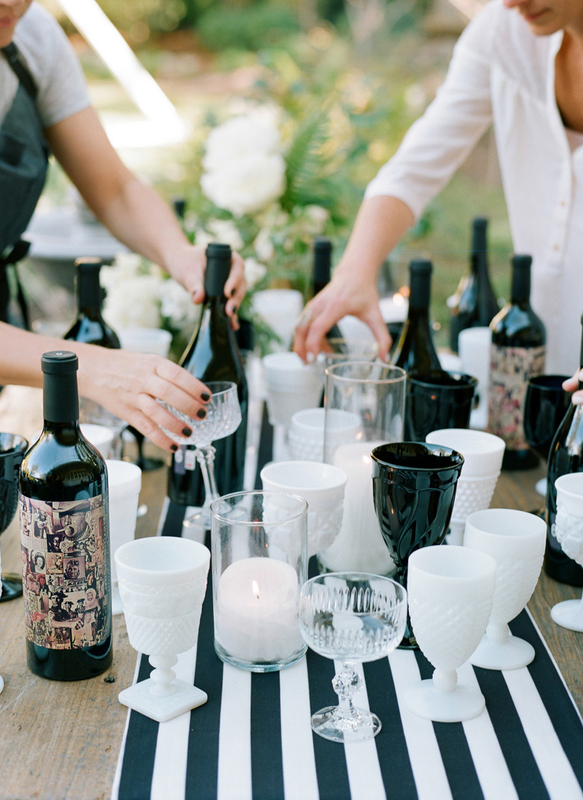 We chose eclectic, vintage furniture and serving platters for all of the tables complete with a variety of perfectly mismatched chairs from Found Rentals. 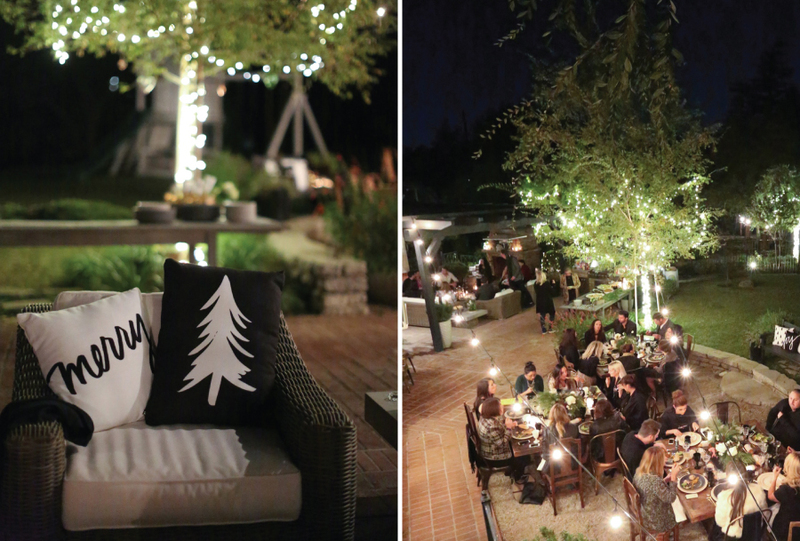 Throughout the evening, guests lounged and dined by the outdoor brick fireplace. I incorporated my handwriting when designing all of the printed pieces, including the menu, to give it just that little edge. We ordered custom tape for wrapping the baguettes because we’re always up for a laugh. 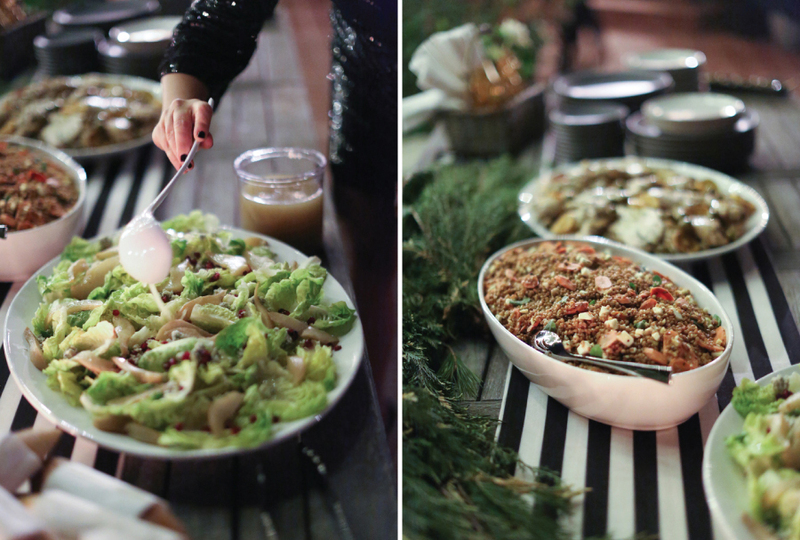 Tiffani crafted and created a menu with everything from a little gem salad with pomegranate seeds, blue cheese and roasted pears to platters of roasted chicken with lemon and Picholine olives. She is an exceptional chef and such a warm and inviting host. Jenny Keller of Jenny Cookies worked her magic on a whole dessert table with mini pies, glittery gingerbread and iced sugar cookies all looking way too adorable on their scalloped cake stands. Thankfully Elizabeth Messina agreed to photograph the evening for us. The shots she got make me drool on my computer screen a little each time I see them. 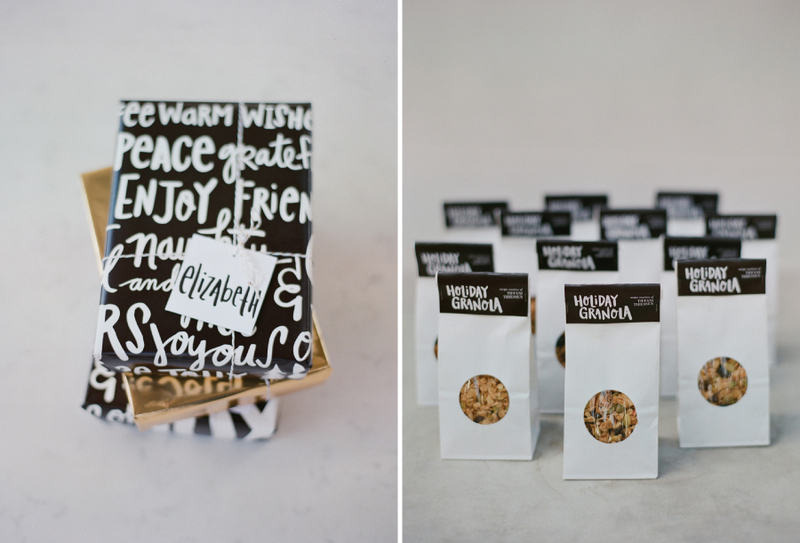 When the party ended, each guest left with homemade granola and other presents wrapped in paper I designed. As is always the case, the people make the party. We were happy to not only work with talented and kind people for this event, but to have even more wonderful people join us for the evening. With the start of this new year, I cannot help but look back and feel such gratitude for the friends and family that I’ve had for years and for the friends I get to meet through working on events like this. 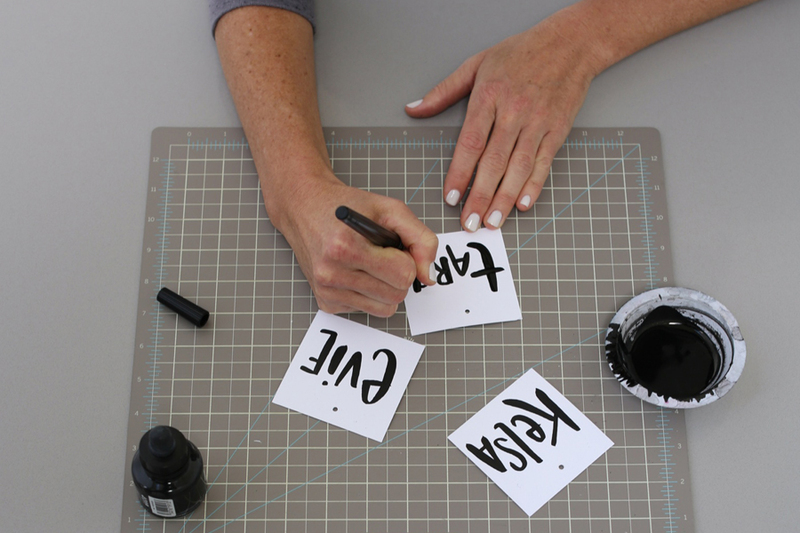 May our 2015 calendars (and beyond!) be filled with good times. Menu crafted by Tiffani Thiessen. Be sure to look for her new show, Dinner at Tiffani’s, on the Cooking Channel. 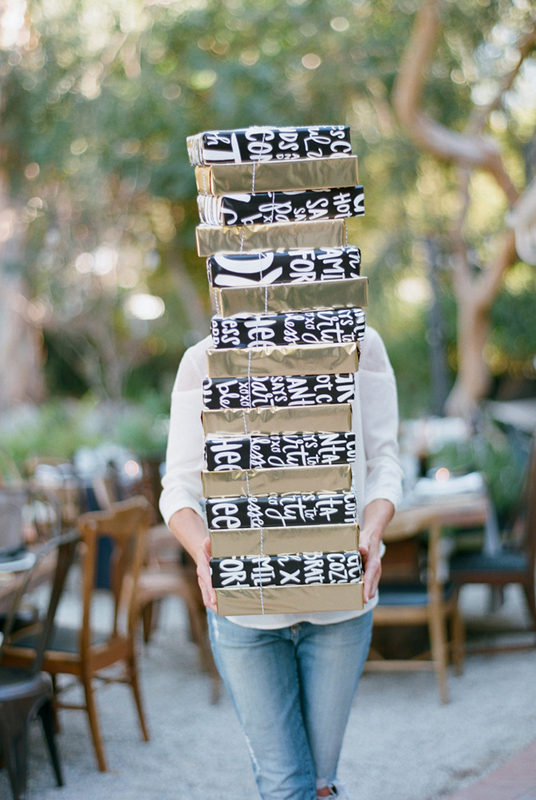 Party décor and gifts designed by me, produced by Tiny Prints and Shutterfly. 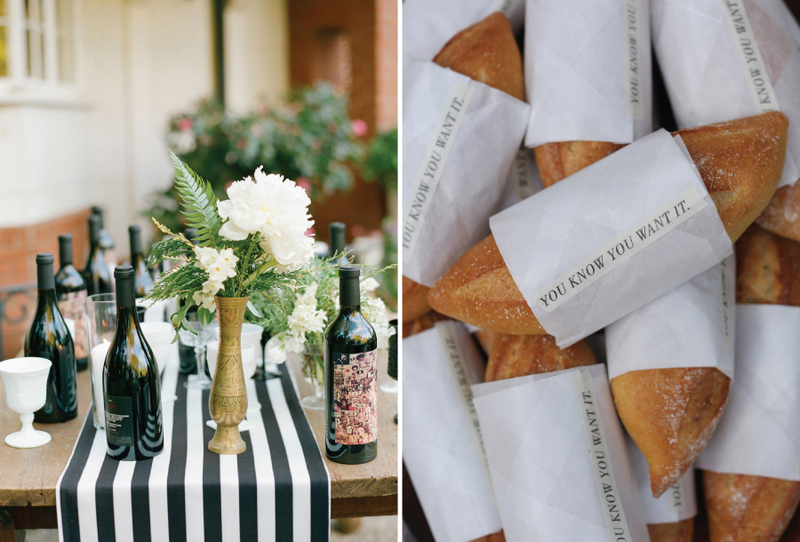 Find their table runners here. Pillows here. The invitation we used for the party here. And a journal we gifted each guest here. Wrapping paper designed by me and printed by Spoonflower. Children’s toys collected to donate to Baby Buggy. Also a huge thank you to our sweet husbands, Wooch Graff and Brady Smith, for all the heavy lifting, getting all decked out and putting up with all of our ideas. And to Vicki. Um wow, you could not be more amazing. Just beautiful!! What a great way to celebrate! Amazing work, as always! Awesome post and the food and decor looks fab and very fun! Congrats, Jill, on your new products and Tiffani’s new show!